healthy, fulfilling and meaningful life. Absolute Care Staffing Health Agency, Inc. is a trusted North Carolina based provider of quality home health care services. We seek ways to help clients at home maintain and improve their level of independence. Our health care staff and case managers are here to support you and your family so that continuity of care is achieved. Whether you’ve recently been discharged from the hospital or managing the symptoms of a chronic illness, we can definitely tailor fit a care plan for your specific health needs. We believe that through efficiently executed home care plans, you can thrive at home under the care of our devoted and trustworthy employees. For every client and family that we care for, we strive to achieve their utmost satisfaction. We hope to bring the same to your home. 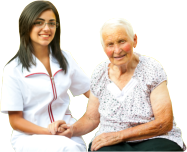 Please choose Absolute Care Staffing Health Agency as your provider of home health services. To request for assistance, please call 919-784-9218.